I wanted to update quickly here on NROM, my pick for 2013 and largest position in my portfolio. It has made the majority of my gains this year– up over 100%, but I think it goes higher from here. 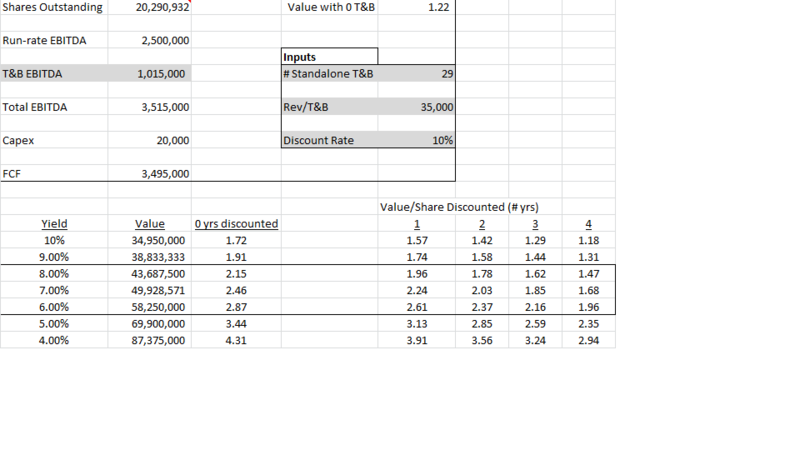 I think the best way to value NROM at this point (given the success in the T&B segment) is to look out a few years, estimate the # of T&B’s, and value the company on a FCF yield basis (which will likely be approximately the dividend yield). This is somewhat of a simplification of course (dta’s wont last forever for example), but I think this is a good way to gauge value in a variety of scenarios. -$2.52-$3.35 if they get to 100 T&B’s in four years. Needless to say, NROM is still my largest position and I am likely not selling anytime soon. This entry was posted in Uncategorized and tagged NROM by thevariantview. Bookmark the permalink.